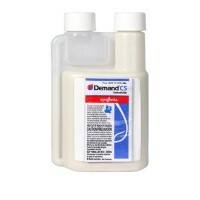 Fourth generation Pyrethroid, Demand CS is a water based, highly concentrated insecticide. Containing Lambda-cyhalothrin, the microencapsulated suspension formulation affords 90 day residual control over such pests as ants, bedbugs, cluster flies, centipedes, crickets, firebrats, millipedes, sowbugs and German cockroaches. Non-staining, Demand CS is ideal for use as an exterior perimeter treatment around a variety of structures. Fourth generation Pyrethroid, Demand CS is a water based, highly concentrated insecticide. Containing Lambda-cyhalothrin, the microencapsulated suspension formulation affords 90 day residual control over such pests as ants, bedbugs, cluster flies, centipedes, crickets,firebrats, millipedes, sowbugs and German cockroaches. Non-staining, Demand CS is ideal for use as an exterior perimeter treatment around a variety of structures.